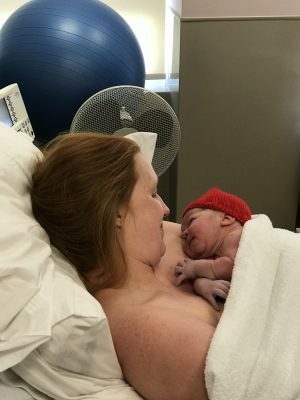 Today I thought I would share with you Henry’s birth story. I always love reading others, so thought why not? Beware though I have probably waffled a lot and it’s quite long! This time around I had done a lot more antenatally to prepare. When I had Oliver I didn’t do any sort of NCT, hypnobirthing or classes. I had wanted to do something to prepare, but working as a nurse on random shifts I didn’t have guaranteed days off to commit to a class. This time around I wanted to be a bit more prepared. 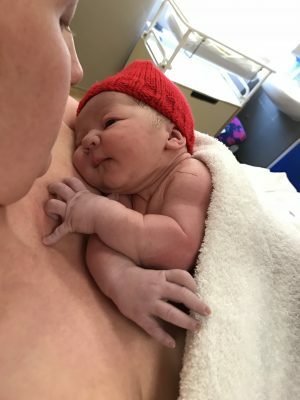 I did an afternoon of hypnobirthing at the hospital and 10 weeks of Ultimate Birthing with Mummas & Beans (well worth doing if you have a Mummas in the area near you!). I felt much more prepared for the main event. 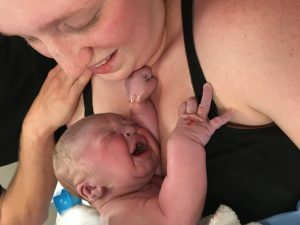 My birth plan was a bit more realistic (I wanted a water birth, but was open to all eventualities) because I knew from my first birth that you when you’re in the throes of labour sometimes you just feel like you’ve had enough! With this pregnancy I had really hoped I would have another early baby. So when it got to the point in time when I was more pregnant than I had ever been with Oliver I felt overdue. Every day I was waking up and hoping that it would be the day. When I got to 39+6, I had made plans for the day to go to my sisters fiancés family home for a birthday barbecue. I had told myself the day before I couldn’t go into labour because I wanted to go to the barbecue! When I woke up that morning my husband asked if I wanted to put my hospital bag in the car (they live about 30 minutes from us, and about 10 minutes from the hospital). I said to him it would be fine, I was sure I wouldn’t go into labour the day so we may as well leave it at home. Just as we were getting ready to leave I had a sudden change of heart. I just felt a bit ‘off’ so decide to take it just in case. On our way over, I realised I had forgotten my hospital notes. I jokingly said to my husband ‘I can’t go into labour whilst we’re out now! Otherwise you’ll have to drive home and get them for me!’. We arrived and enjoyed the barbecue, but when we sat down to give him his presents at about 4pm I started getting terrible back ache. As the afternoon went on I started getting some very mild, irregular contractions. I wasn’t sure if they were Braxton Hicks or real contractions, so I didn’t mention it to my husband. By the time we got home at about 8pm I had noticed the contractions were getting more regular and they were more uncomfortable. I downloaded a contraction timer app and started monitoring them whilst my husband gave Oliver his bath and put him to bed. They were around 10 minutes apart but only lasting about 30-45 seconds each. I decided the best thing was to have a relaxing bath and go to bed, so that’s what I did. We didn’t actually manage to go to sleep until about 1am because my husband and I were chatting. But it definitely helped that I rested in this early stage. I dozed from about 1-2am but woke up because the contractions had become a lot closer together and had started to last around about a minute long. We kept monitoring them and the gap between them was ranging from between 2-5 minutes. The contractions were getting more uncomfortable and although I was able to breathe through them I decided to give the TENs machine a whirl. It really helped to distract me from the pain. By 3am the contractions were coming every 1-3 minutes so I decided to call the triage line, who asked whether I wanted to come into hospital yet. I decided that this would be best, as the gap between the contractions was so short, I was worried that as we lived half an hour away we could get caught out if I left it too long. Thankfully my mum lives at the other end of my road (all of about 500 yards away) so we bundled Oliver up in his duvet and took him up to my mums. We also picked my sister up from there, as she wanted to be at the birth this time around (and I wanted her there too!). When we arrived at the hospital, I waddled in and got the lift up to the ward. I had thought of walking up the stairs to help things along, but the ward is on the third storey and I really didn’t fancy the long walk! When we arrived I was admitted onto the midwife led unit, something I was really pleased about. I had wanted to use it when I had Oliver, but due to a higher than normal blood pressure when I arrived they wouldn’t let me. I had a lovely third year student midwife look after me until the day shift took over. She checked baby was ok with the doppler, but when she checked his position she wasn’t sure if he was still head down. I knew he was because he had been down for at least 6 weeks and his head was fully engaged. But he had a very prominent bum which confused her! I ended up having one of the midwives come in and scan me to check his position and she confirmed his head was just super low down and he had a very stuck out bum! At about 6:30m they asked if it was ok for them to check my cervix. This took the student and a qualified midwife to find, because baby’s head was so low they said my cervix was tucked around the back. I was only 2cm, which I found so bizarre considering the closeness of the contractions! They were happy for me to stay in though as my contractions were close and regular. When they changed shifts, I had my midwife come in and introduce herself. She also had a first year student midwife with her who was on her first day on delivery suite. I asked them to fill the pool for me as I thought it may help me a bit. I probably spent about an hour in and out of the pool. It was great for pain relief and I was managing to breathe through my contractions with ease. When they came to check my dilation at 10:30am I had gone up to 3cm. My husband keeping us amused, he climbed in the pool and told us it was a boat. This was followed by a swift jump out when the midwife started walking through the door!! At around 3pm the midwife came back to check my dilation again. I was now at 5cm. I think she could see I was tiring, so she gave me the option to have my waters broken. She warned me it could ramp up the intensity of the contractions, which was fine by me. I agreed, so she went ahead and burst them for me. 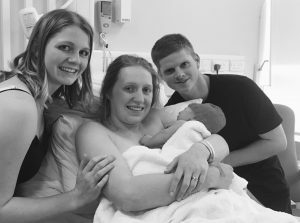 The waters had a moderate amount of meconium in them, another midwife came in to check them, and they decided I couldn’t stay in the midwife led unit as the baby may need assistance when he arrived as it was a significant amount of meconium. 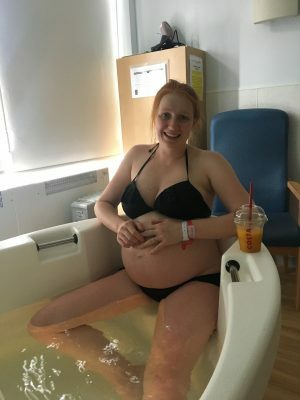 I did feel a little disappointed, as again I wasn’t going to have the water birth I had hoped for. But I knew that it was for the best, so we moved up the corridor to the main delivery suite. 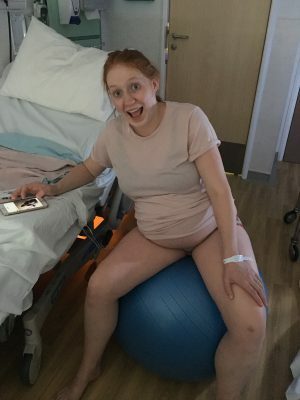 I spent a little bit of time bouncing on the birthing ball, but the contractions were becoming a lot more intense and not as manageable with breathing and the TENs machine (which my husband later pointed out had actually fallen off!). The midwife gave me options for pain relief, I declined pethidine as I get really bad nausea and sickness from opiate based medication. She told me to give gas and air a chance, as last time it had made me feel really sick. Unsurprisingly I was sick, but after a few more puffs I got a bit more used to it. It didn’t really have that much of an impact on the pain from the contractions, and I was feeling really tired. So at around 4pm I asked the midwife for an epidural. She went off to organise it, but by the time she came back I had the overwhelming need to push. I remember her asking if I felt like I needed to push and I said something like ‘no it’s just a lot of pressure down there’ and my sister said ‘yeah Louise I think you’re pushing’! They got me to hop up onto the bed to check things, and I was fully dilated and the baby was coming. I really hadn’t wanted to give birth lying on my back, but at this point I really didn’t have the energy to a) fight it, or b) actually move into a more comfortable position! So after 45 minutes of pushing, groaning, and declaring I might be dying (my sister reassured me I wasn’t!) Henry Andrew Miller arrived, with both his auntie and daddy by my side. He was born at 16:57 on Sunday 13th May, his due date, weighing 8lb 10oz. I didn’t actually use any pain relief during those 45 minutes and I was so proud of myself for managing to get through it without anything on board! I was also very pleased because the first year midwife was able to be there and it was her first birth! She was so happy that I gave birth before the end of her shift! Both my husband and sister were incredibly helpful in those 45 minutes of pushing. My sister spent the time coaching me, and reassuring me I was doing fine. She kept an eye on the business end whilst my husband stayed up top and stroked my hair and held my hand. Henry was absolutely fine when he was born, even though they had called in an extra midwife and the paediatrician just in case the meconium had caused problems. He was placed straight on my chest, crying away and my husband cut the cord. I had really wanted him to do it as with Oliver it hadn’t been possible. I put Henry straight to the breast and he latched on very quickly and started suckling away. We had a quick look at the placenta, apparently it was quite a chunky one and looked very healthy. It’s amazing how it keeps them alive for 9 months! I had a 2nd degree tear which needed stitching, the midwife got me to use the gas and air for this, it helped but I started feeling really dizzy on it so had to stop after a few puffs! My sister had cuddles whilst my husband held my hand through the stitching. Henry had his vitamin K injection and I then went for a shower and freshen up. 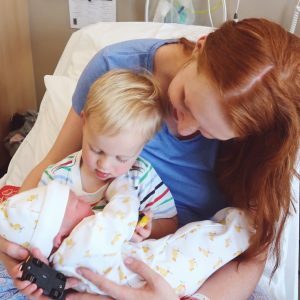 Oliver came in to visit at around 7pm, he was mostly just excited because Henry has given him two Disney Cars but he was happy to give his new baby brother a cuddle and then run around the room touching everything! It was so lovely to see him discover his baby brother for the first time though, and even though he wasn’t particularly bothered by him, it will be a memory I treasure! 3 weeks later he is very much in love with his brother and constantly wanting to pick him up, cuddle him and try and share his toys/food/drinks. 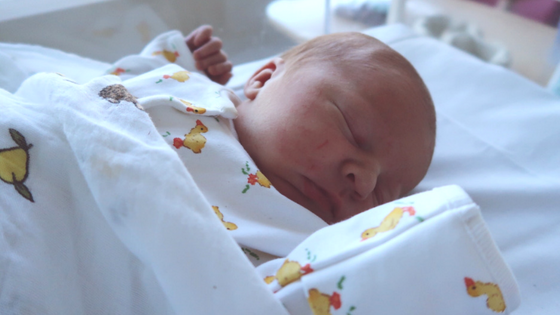 As there was a significant amount of meconium in the waters, Henry had to stay in for 12 hours of observations, so we were moved to the postnatal ward at around 9pm. I chose to have a private room, as I’m staff they let us use the rooms at a discounted rate, and I really didn’t want to have to share a bathroom!! 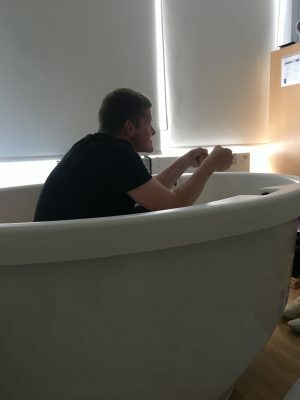 My husband had his brother deliver us a Burger King as the hospital meal arrived when I literally had just given birth and I really didn’t fancy eating at that point. My husband went home for the night and collected Oliver, dropped him off at pre-school in the morning and then came back in to the hospital. We had hoped we would be able to leave before 12 as Oliver needed collecting at 12:30 but annoyingly the paediatrician didn’t come to do their checks until 12 when my husband had just left. Thankfully they discharged us at 1pm and I walked down to the entrance with Henry and met my husband by the front doors as Oliver had fallen asleep in the car on the way over. He was very excited to have the baby at home with him and once we were home he constantly kept going to have a look at him! 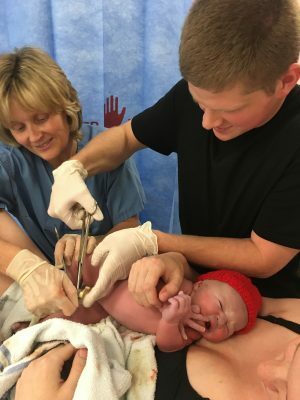 I had a great birth this time around, it was much more painful than the first time because I could feel everything. 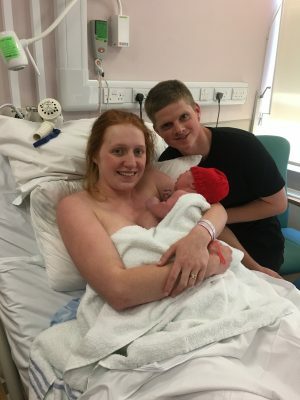 But I think that having done birthing classes and a bit of hypnobirthing helped keep me calm and work my way through the pain of the contractions. A big thank you to Steph from Mummas & Beans for all her advice and to Sue the midwife who delivered Henry. Previous Post Birth Announcement: Welcome to the World Henry!